Yes, people, this is the ultimate roll-your-eyes-because-I-am-bragging post. Go ahead, sigh at me. Shake your heads. Roll those eyes. Cluck your tongues in annoyance. Thou shalt not stop me from sharing these amazing meals with the world! Okay, so honestly, aside from the element of sweet bragging, I genuinely want to share these amazing dishes/treats with you! Some are available in countries outside of Europe or can be created at home, so why not have a go at tracking them down/making them yourself. I for one am totally down on pretending to be in Europe via delicious culinary experiences! So here we go, in no particular order – some culinary delights to inspire you over the summer and transport you to the European continent, all from the comfort of your own home! I ordered the goats’ cheese and chorizo salad and it was UH-MAZING! The name of the salad was “Our Favourite Salad”, and as described by the menu, it includes: “goats’ cheese, honey glazed chorizo, toasted pine nuts, balsamic reduction”. Think donut. Think Nutella. Think strawberries and whipped cream. This baby has it all! For those of you still struggling to picture it, this is the freak shake of the doughnut world! The trdelník is a pastry very similar to a doughnut. It is long strip of pastry which has been wrapped around a spit and then cooked and sugared, so it is essentially a cylindrical pastry with a hole in the middle. So apparently, these beauties were traditionally served plain, but the rise of Instagram and humanity’s love of all things crazily-sugared has been attributed to the emergence of all sorts of these decorated treats. You can choose classic Nutella, or Nutella with cream, or caramel, or strawberries, or whatever else they choose to offer! 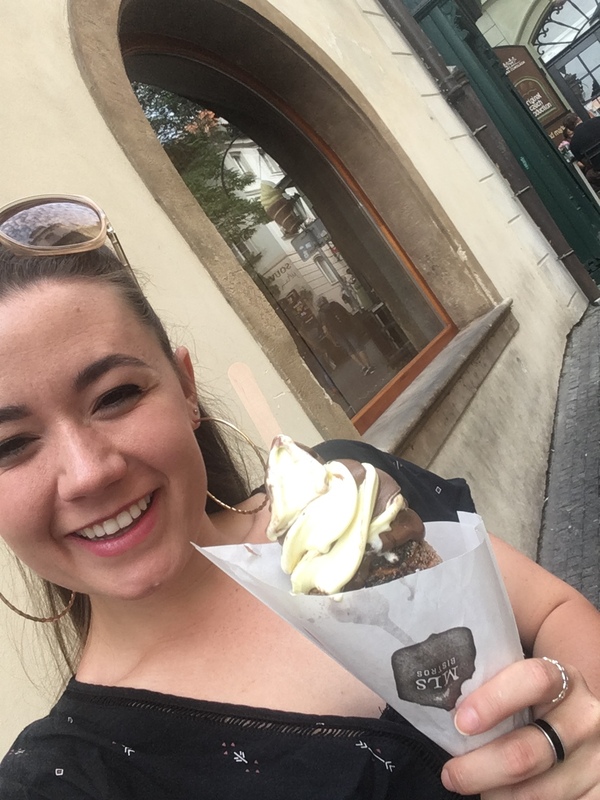 Walking the streets of Prague, it was unusual to see anyone eating a trdelník that wasn’t overflowing with sugary goodness. If you are spending the day out on the town and need a bit of a sugar burst/pick me up, this is definitely the go-to snack. When in Germany, visiting a bierhaus is an absolute must! We went to Hofbräu München in Berlin and it was amazing. When visiting, be mindful that due to the nature of the bierhaus, it tends to get pretty noisy inside. That being said, it isn’t uncomfortable, and the packed room does add to the delicious culinary experience. First up was a potato soup with lovely chunks of potato. The soup was the perfect consistency and I absolutely loved it! It was so flavoursome that I went for seconds, even though I knew that more food was coming! The main course was a massive pork knuckle, complete with crackling, gravy and sauerkraut. The pork was incredibly soft, that fall-off-the-bone and melt-in-your-mouth kind of soft. One word: delicious! I’m not a massive fan of sauerkraut, but it complemented the dish, and I was very impressed overall. Finally … dessert! Mini pancakes in custard. Needless to say, I was a very content and very full traveller that evening! Over the years, there has been a high rate of Turkish migration to Berlin, meaning that the kebab game in the city is strong! There are many kebab shops along the place, and having heard about the great kebabs of Berlin, I had high expectations when I stopped at a small kebab shop for lunch. However, I was certainly not disappointed! It was hands down the best kebab I have ever had! So good! Even now, no kebab has lived up to that one amazing lunch, and I live in an area of Sydney in which there are some very good kebab shops! Excuse the not-so-great-quality photo, but I was way too excited and hungry to pause for a photo shoot! Needless to say, this baby was devoured quickly! Okay, so this one is kind of cheating because I can’t send you all to my aunt’s house for dinner. However, in my defence, this soup is amazing! It is the most comforting and warm tomato and barley soup, and I just love it! I was so excited that I snapped a photo to send to my family back home – and they were very jealous! Before going to Italy again, I was majorly excited for this – emphasis on the ‘majorly’. Crema di caffè is a blessing to all those who like their coffee but want to enjoy it in the heat. It is creamy and icy, with that distinct coffee taste, and many places include a little waffle as well! It is the best pick-me-up, and is one of my favourite things in the world! Café Frei is a chain in only a few countries in the world, and it hasn’t reached Australia yet. There are a few of these around the place in Budapest and they have an amazing range of drinks and cakes from all over the world. I went here for a sugary “lunch”, and it was amazing! I would really recommend coming here and trying one (or more) of the really cool coffees or other drinks that they have on offer. Okay, so I am not a big eater of sausages (Ii have high cholesterol) and I don’t really like spicy foods. But, when in Dresden! A large group of us went to Curry 24, one of the most well-known currywurst places in Germany. They have a scale of (if I remember correctly) 9 levels of spice. I opted for the conservative 4, and it was a bit hot for me! As I said, it wasn’t really my thing, but a lot of other people on the tour loved their currywursts and it was an essential German experience! This was the best soup I have ever had in my life. Coming into Portree, I was cold and sick and my boots had filled with mud, meaning that my wet socks had chilled my toes. The tiny bakery was constantly filled with customers and their products were all made by the amazing ladies who worked there. Each day, a new soup was on offer and I was so happy to taste the amazing chicken soup which they were serving. It was warm and delicious and filled with vegetables and thick chunks of chicken. Yum! So good! Add to this that it only cost £1.20 for one cup, I was so happy with my lunch decision! The only disappointment was that when I returned to buy another cup of soup, they had sold out! Nowhere does fries like Amsterdam! They are thick and crisp, and often come with mayonnaise. After a night out on the town, they are just what you need to tie you over on your way home. They definitely deserve a mention and a quick pic!